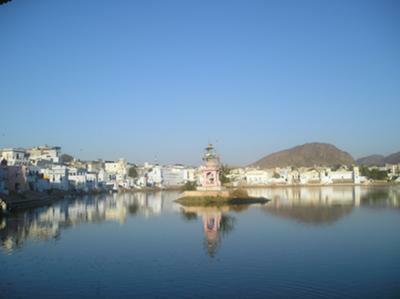 This picture was taken while on a visit to Pushkar, Rajasthan, India. 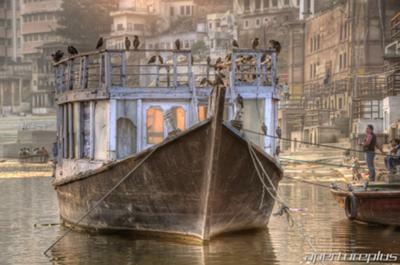 The ghat serves a multi purpose with being a water source and also a holy water for pilgrims. 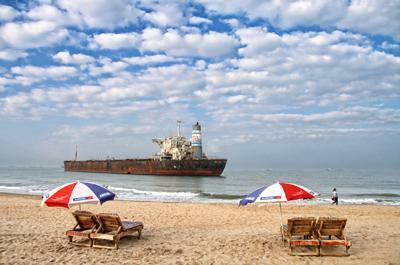 The River Princess, a 240-meter long ore carrier belonging to M/s Salgaocar Mining Industries, ran aground off the Candolim-Sinquerim coast of North Goa, India, in June, 2000, and has been stuck there ever since. 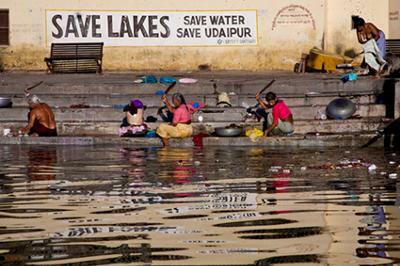 It has proved to be a huge environmental disaster. Over the years the ship has settled nearly 10 meters into the seabed, taking in between 30,000 and 40,000 metric tons of sand. Not only has this had a terrible affect on the seabed, altering it with each passing day, but it has completely changed the topography of the beach. And for the last ten years the hulk has been corroding, leaving rusted fragments, like shrapnel, washing ashore and threatening bathers. Due to political wrangling over the removal of the ship, it will probably sit there another 10 years. 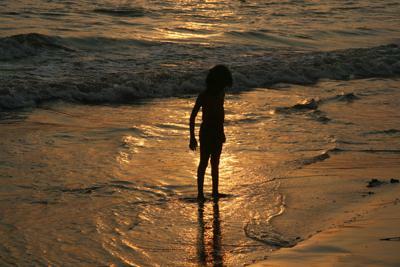 A young girl plays in the water at Juhu Beach in Mumbai, as the sun slowly sets behind her. 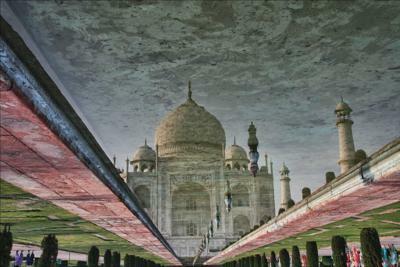 I Took this Picture in 2008 in one of my first weeks in India. I was staying on a houseboat in Kashmir, on Lake Dal. I Don't remember the camera but it was something basic - just a simple point and shoot. I love the light with the silhouettes of the boats in the Background. 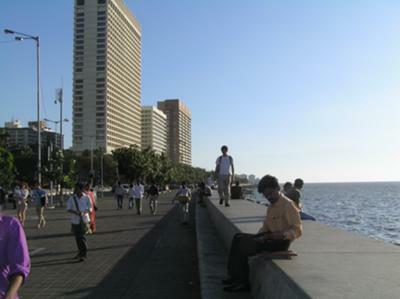 A scene along the 3 km long Marine Drive Promenade, Mumbai(Oberoi Hotel - the tallest of the three buildings was under siege during the infamous Terrorist Attack on 26th Nov 2008). Taken in March 2011....fresh memories of the city I grew up in. Dew - The Water Diamonds! 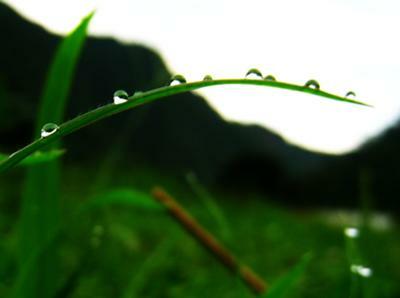 Beauty created by dew-drops near the Ganges at Rishikesh. 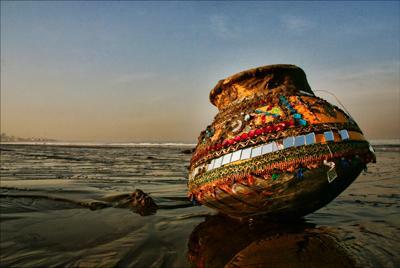 I captured it somewhere on the morning of 29 July 2011. 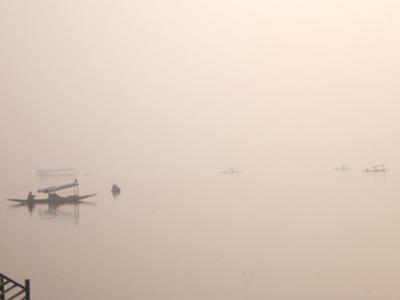 A Boat on the Ganga in Veranasi, India. The beautiful waterfalls, 30kms outside picturesque Bundi and well worth a terrifying tuk-tuk ride..!!.. :) .x.x. 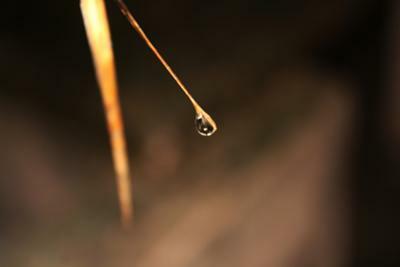 I captured this water droplet on 29th morning after heavy rains in Chennai. 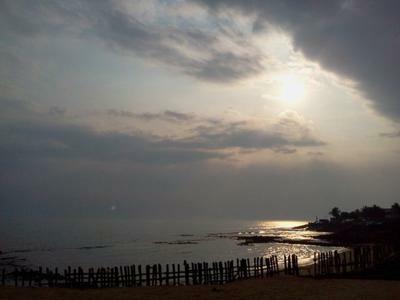 This photo shows a golden lining over the horizon before the sunset which actually shows us that there is a ray of hope that is left even after the sunset, which may bring us a better tomorrow. 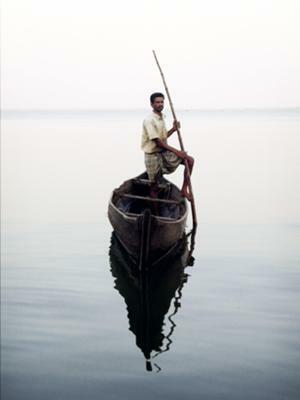 The photo was taken at Chilika Lake, Orissa. 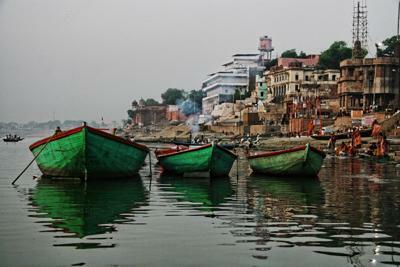 3 green boats float quietly, side by side, off shore at Varanasi, upon India's most holy river, the Ganges. 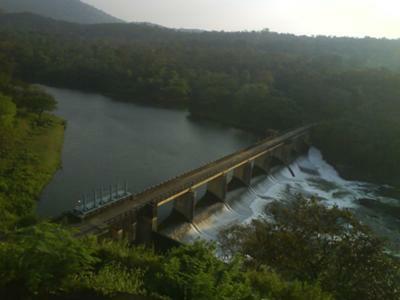 Rural area of southern state Kerala. 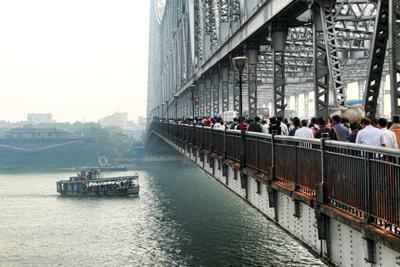 Kolkata's most famous landmark, the Howrah Bridge, is a modern engineering marvel. This unique cantilevered bridge, made up of more than 2590 metric tonnes of high tensile steel, connects Kolkata's main railway station on the Howrah side of the river with Kolkata proper. The bridge spans about 500 metres, with two huge supporting pillars which rise to about 90 metres above road level. It was opened in 1943. Over one million people a day cross back and forth over the bridge. 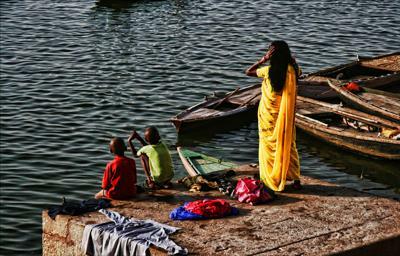 A woman in a yellow sari watches the wavy water at Varanasi, India. 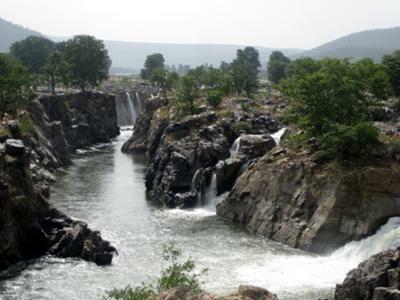 Hogenakkal waterfalls is on River Kaveri and is located in the state of Tamil Nadu. This snap was taken in the month of June before the heavy monsoon showers. 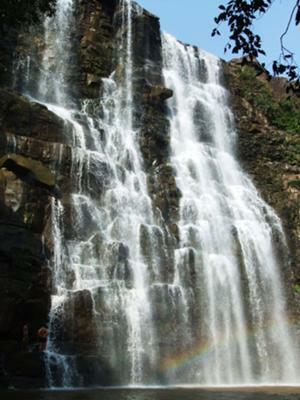 During monsoon this place become one single waterfall stretching over a distance of 400-500 meters (my guess). 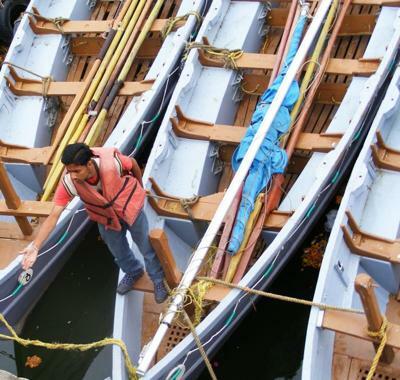 One can take a also take a Coracle boat ride in the stream. I took this picture while rowing my car through the flooded streets of NOIDA. 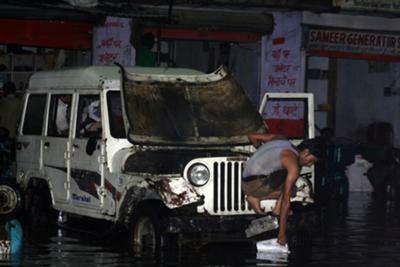 This enterprising young man decided to fill his can from the deluge around his vehicle. 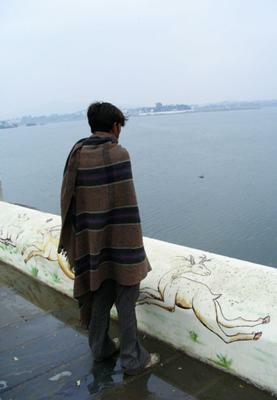 Longing look into the Fateh Sagar lake in Udaipur, Rajasthan, India after the rain. 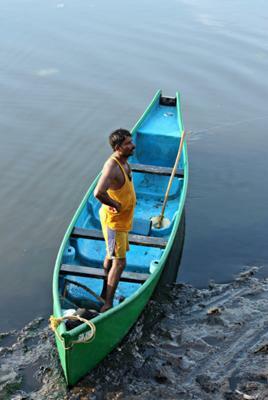 Waiting for his companion before sailing out for fishing. Taken along the Mandovi river (Panaji, Goa)in November, 2010. 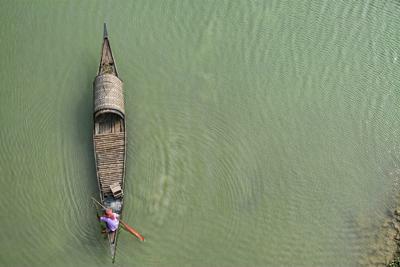 A lone fisherman sets his net in a small backwater on the Ganges River near Kolkata.